New videography techniques have opened up the oceans’ microscopic ecosystem, revealing it to be both mesmerizingly beautiful and astoundingly complex. Marine biologist Tierney Thys teamed with Christian Sardet (CNRS/Tara Oceans), Noé Sardet and Sharif Mirshak to use footage from the Plankton Chronicles project to create a film designed to ignite wonder and curiosity about this hidden world that underpins our own food chain. 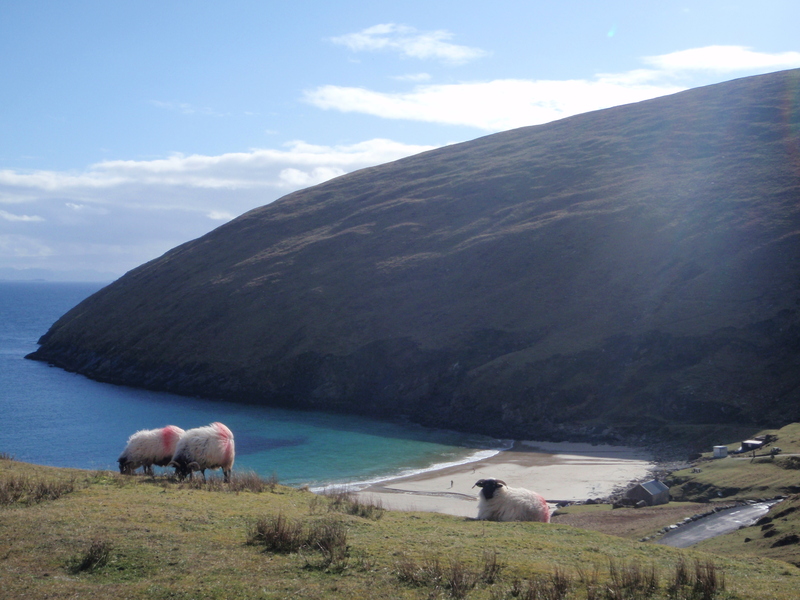 Stay tuned as Dr. Tierney Thys is going to be giving a talk at the Ryan Institute, Galway, this week. 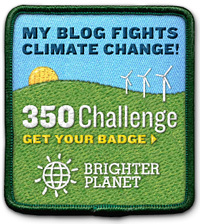 See also the website Plankton Chronicles for amazing videos of plankton. 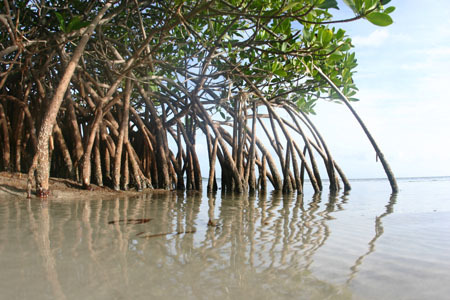 Mangrove forests and swamps are saline, coastal habitats found in tropical and sub-tropical hot, wet areas. Together with saltmarshes, mangrove forests are a place where vascular plants can be found dominating in the marine environment. Mangroves are large shrubs or trees up to 45m in height, amongst the most productive and biologically complex ecosystems on Earth (Barnes and Hughes, 2002). Mangroves support unique and diverse ecosystems of bird, monkeys, kangaroos and snakes and crocodiles, fish, shellfish, tree climbing crabs and bees to name a few (National Geographic). Often found intertidally and protected from high-energy wave action, the trees have aerial roots and trunks which reduce the local water velocity and act as sediment traps. In a similar way to saltmarshes, mangroves raise the level of the shore and help to stabilise the land. 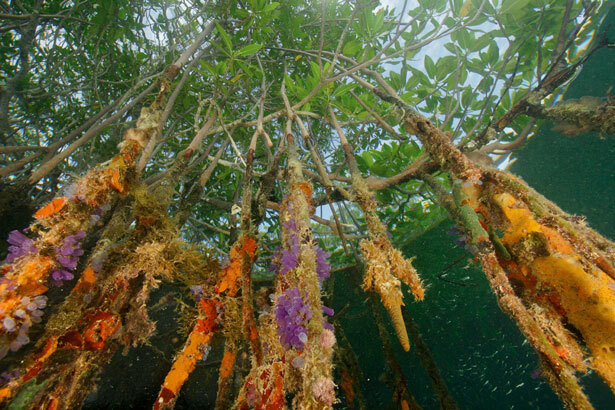 Mangroves forests are filled with creeks and channels in densely vegetated areas. Mangrove plants require a number of physiological adaptations to overcome the problems of anoxia, high salinity and frequent tidal inundation. Each species has its own solutions to these problems; this may be the primary reason why, on some shorelines, mangrove tree species show distinct zonation. Small environmental variations within a mangal may lead to greatly differing methods for coping with the environment. Therefore, the mix of species is partly determined by the tolerances of individual species to physical conditions, like tidal inundation and salinity, but may also be influenced by other factors such as predation of plant seedlings by crabs. The diversity of the rocky shore increases down the shore. Most organisms on the seashore originate from the marine environment and hence they are better able to adapt to cope with the conditions of the lower shore rather than the upper shore. Following on from this post, here are the typical species we found during our survey of Black rock, an extremely sheltered rocky shore in Pembrokeshire, south west Wales. Very few species of invertebrates have been found in the splash zone- spring tails– one of the few insects found on the seashore and the rough periwinkle– Littorina saxatallis agg. The rough periwinkle is well adapted to cope with the conditions in the lower part of the splash zone, with a modified gill cavity which acts as a small lung. Hence, gas exchange can be carried out more effectively in air, as the splash zone is never immersed. As few other marine organisms have managed to adapt in this way, rough periwinkles do not have to worry so much about competition restricting their niche. This is a major advantage of living in the splash zone. 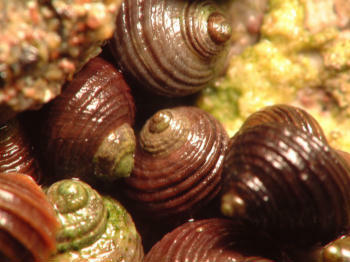 Rough periwinkles are known to feed on lichens, which are found to be the dominant plant-like species here. The fungus and algae symbiotic pair is very well adapted to living in the harsh conditions (Cremona, 1986). Rough periwinkles have plenty of food in the splash zone. They excrete uric acid rather than the more toxic ammonia, which needs to be diluted before being excreted safely. Hence, abiotic stresses such as dehydration are more likely to be limiting the vertical range of other invertebrates. The rough periwinkle copes with desiccation stress by maintaining a tightly placed, mucus sealed waterproof shell. The upper shore is immersed for up to 20% of the time, resulting in an increase in the number of invertebrate species found here. Organisms found here include the orange sponge , beadlet anemone Actinia equine, topshells, the common mussel Mytilus edulis, the common limpet, Patella sp. 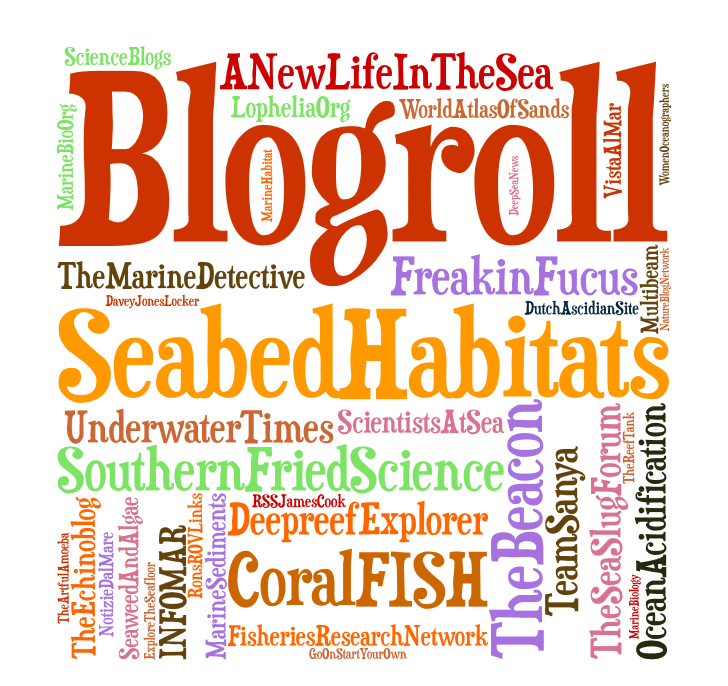 , prawns and shrimps and barnacles amongst others. 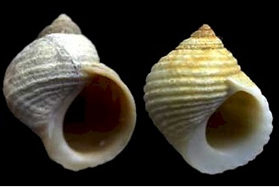 The species of molluscs found on the upper shore all possess an outer shell, as an adaptation to avoid water loss during the period of emersion. Prawns and shrimps are only found in rockpools and hence are living in a suitable microhabitat found at this height. 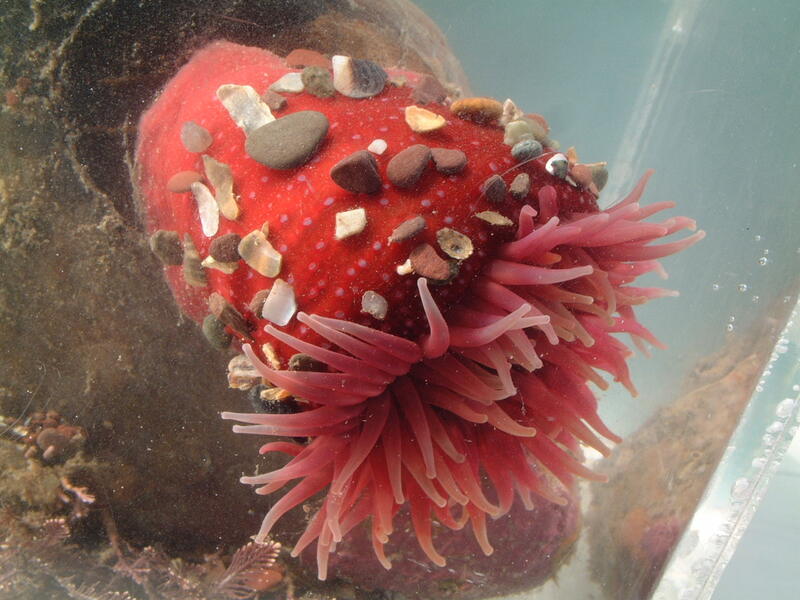 The beadlet anemone is adapted to minimise water loss by being able to reduce the body surface area by withdrawing its tentacles and secreting a mucus seal when out of the water. Macroalgae are now able to survive at this height, with the presence of more tolerant species such Pelvetia canaliculata, the channelled wrack, Entromorpha ssp. (now Ulva…) and Fucus spiralis. This provides a more sheltered damp environment for invertebrates to live. Lichens no longer dominate the plant- like species and only the black tar lichen Verrucaria maura and the green tar lichens are present in abundance in this zone. The lower part of the upper shore marks the start of the barnacle and limpet zone, which extends down to the lower shore. 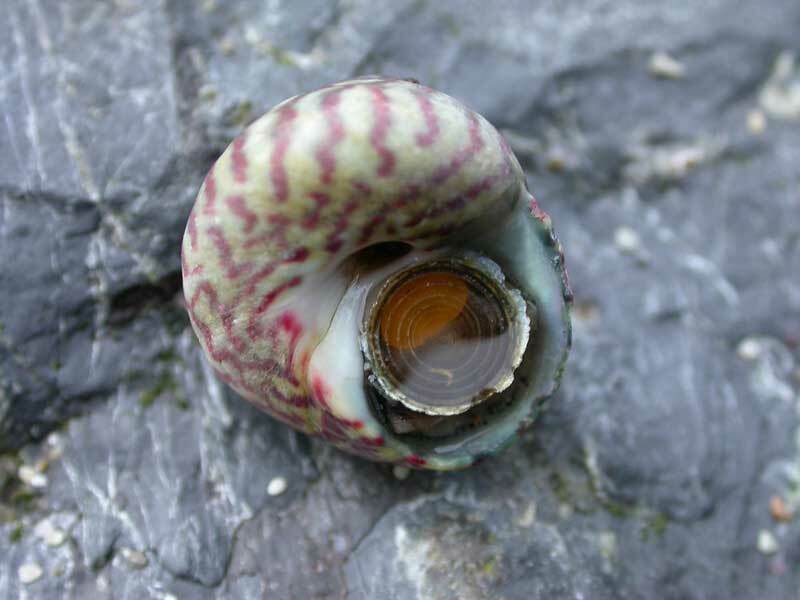 The diversity now begins to significantly increase, with the presence of species such as the Dahlia anemone Urticina felina, the snakelocks anemone Anemonia viridis, the gem anemone Bunodactis verrucosa, the dog whelk Nucella lapillus, the edible periwinkle Littorina littorea and mobile animals such as the common shore crab Carcinus meanas to name a few. This section of the rocky shore is regularly immersed in water up to 80 % of the time. Hence the problems associated with abiotic stress no longer remain a great issue (other than in rockpools, where the small volume of water results in variable salinity and temperature.) A more diverse range of organisms are found in greater abundance down the shore and biomass correspondingly increases. With this increase in diversity and biomass, biotic factors such as predation, for example by mobile animals such as crabs and dog whelks are more likely to limit the distribution of a species. 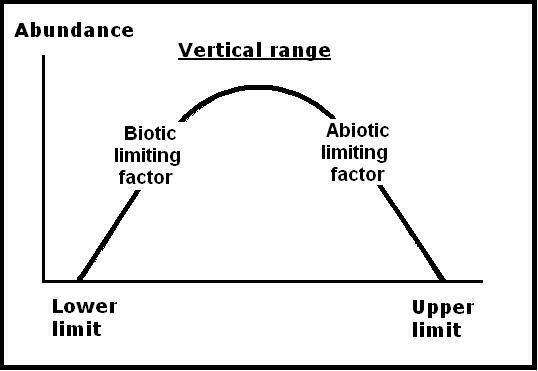 So it can be generalised that the upper limit of a species’s vertical range is determined by abiotic factors and the lower limit determined by biotic factors. The sketch below shows the factors controlling the vertical range of species and its ecological niche. The lower shore is the most favourable environment for the marine organism and is fascinating to explore during the low spring tides. A variety of organisms, including nudibranchs, brittle stars and paddle worms have been found. The serrated wrack Fucus serratus is the fucoid least able to tolerate water loss and hence is found at the lowest point of the fucoid zone. Following this in the lower part of the lower shore, the Laminaria saccharina takes over. The large sugar kelp colony and holdfast provides a host of microhabitats for invertebrates. 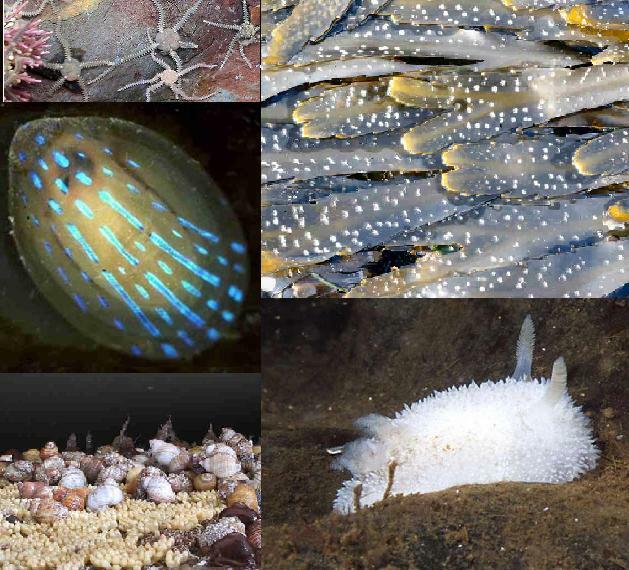 Examples include the blue-rayed limpet Helcion pellucidum, bryozoans, tunicates and spiral tube worms Spirorbis sp., as well as echinoderm grazers such as the shore urchin Psamechinus miliaris. Additionally, as red seaweeds are intolerant to high light intensities, they prefer the lower shore, where sunlight has begun to attenuate. The sugar kelp Laminaria saccharina is found rather than other kelp species, which are found in more exposed conditions (giving it a 7). We found a more or less continuous distribution of limpets and barnacles rather than Ballantine’s suggested more patchy distribution. Additionally, it should be noted that Blackrock was one of the sites used to determine the Exposure scale. 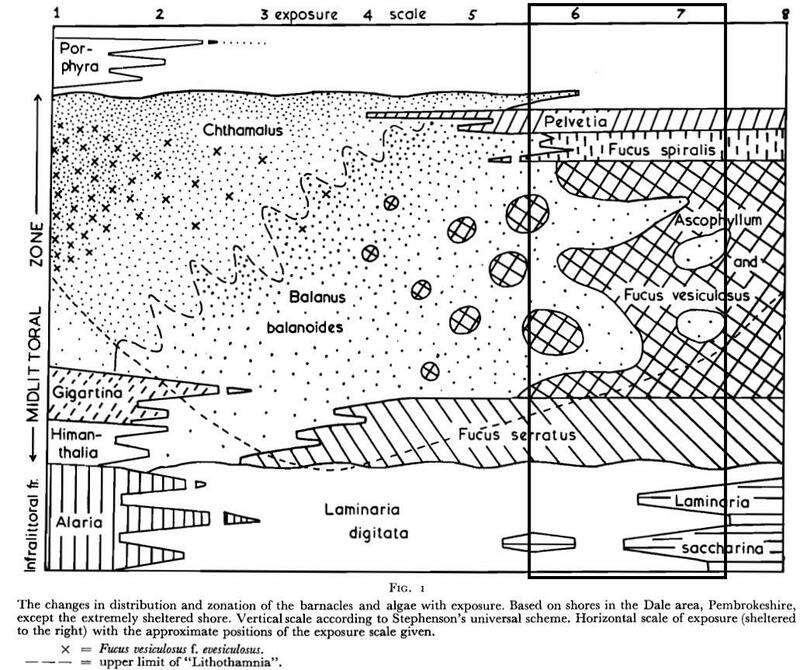 7) Modified after Ballantine, 1961, A biologically-defined exposure scale for the comparative description of rocky shore, Field Studies Journal, FSC Council Publications Vol 1(3) 17.